The Dakota Wizards were an American professional basketball team based in Bismarck, North Dakota. They played in the NBA Development League from 2006 until 2012. After the 2011–12 season, the team relocated to Santa Cruz, California, and now plays as the Santa Cruz Warriors. Prior to entering the D-League in 2006, the Wizards spent 11 years playing in minor American leagues such as the International Basketball Association and the Continental Basketball Association. The Wizards began play in 1995 in the International Basketball Association (IBA), and in 2001, with Dave Joerger at the helm, they won the IBA championship in the league's final year of operation. 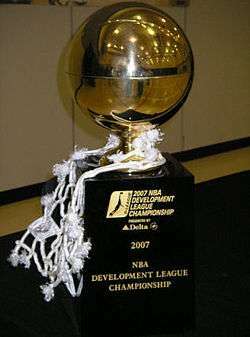 Following the 2000–01 season, the IBA merged with several teams from the Continental Basketball Association (CBA), and in their first year in the new CBA, Joerger and the Wizards won the league title, defeating the Rockford Lightning. After making it to the semifinals in the 2002–03 season, the Wizards again won the league title in 2004 over the Idaho Stampede, giving Joerger his third title as the Wizards' head coach. Following the 2003–04 season, coach Joerger left the Wizards for a coaching opportunity with the Sioux Falls Skyforce. In his place, the Wizards appointed former assistant coach Casey Owens as head coach. The Wizards lost their opening two games against the Skyforce, but then cruised to a 12-game winning streak before losing to Sioux Falls on New Year's Eve, 2004. The Wizards also lost two potential all-stars, Billy Keys and Dickey Simpkins, who left the team mid-season to play overseas. The Wizards went on to clinch home court advantage throughout the 2005 playoffs with a league-best 32–16 record. Dakota split their first four playoff games with their first-round opponents, the Sioux Falls Skyforce, until Sioux Falls won Game 5 with a 102–97 victory, ending the Wizards' playoff run. For the 2005–06 season, the Wizards replaced Casey Owens with former Baylor University head coach Dave Bliss. However, with the coaching change, the Wizards dropped from first in 2005 to out of the playoff race in 2006. Bliss resigned following the 2005–06 season, as season that saw the Wizards finish with a 19–29 record. In April 2006, the Wizards and three other teams (Colorado 14ers, Idaho Stampede and Sioux Falls Skyforce) withdrew from the CBA in order to join the emerging NBA Development League. For their first season in the D-League, the Wizards brought back head coach Dave Joerger. Joerger guided the Wizards to a 33–17 record in 2006–07, good for the first seed in the Eastern Division. He went on to lead them to the Championship Game, where forward Darius Rice came off the bench to put together a record-setting night that led the Wizards to a 129–121 overtime victory over the Colorado 14ers. Rice scored 52 points and made 11 three-pointers, including one with 4.5 seconds left in regulation to send the game into overtime tied at 109. Rice's points and three-point field goal totals set D-League championship game records. With the departure of the Dave Joerger following the 2006–07 season, having being hired by the Memphis Grizzlies as an assistant coach, the Wizards hired Duane Ticknor to replace him. In July 2007, the Wizards became affiliated with the Grizzlies and the Washington Wizards. In 2007–08, the Wizards were again division champions, this time finishing as the first seed in the Central Division. They were, however, defeated in the first round of the playoffs by the arch rival, the Sioux Falls Skyforce. The Wizards continued to make the playoffs in 2008–09 and 2009–10, but with a missed playoff berth in 2010–11, the team missed the postseason for the first time since 2005–06, and just the second time since 1998–99. The Wizards concluded the 2010–11 season with a 19–31 record and in fourth place in the eight-team Eastern Conference. On June 28, 2011, the Golden State Warriors, led by Co-Executive Chairmen Joe Lacob and Peter Guber, purchased the Wizards franchise from Bismarck Professional Basketball LLC. The Warriors became the fourth NBA team to own and operate their own NBA D-League affiliate, joining San Antonio, Oklahoma City and the Los Angeles Lakers. The Wizards remained in Bismarck during the 2011–12 season, but the Warriors were open relocating the team to Northern California in 2012. To reflect the new ownership, the Wizards debuted with a new color scheme, the Warriors' blue and gold, used as an alternative to the purple and green, which dates back to their IBA days. The old color scheme was still used with the team's road uniforms, while the blue and gold was used with the home uniforms and the logo. The Wizards were led by Edwin Ubiles in 2011–12, as he helped the team return to the playoffs with a 29–21 record. However, they were unable to move on past the first round following a 2–0 defeat at the hands of the Bakersfield Jam. Following intense off-season discussions regarding a move, on October 10, 2012, the Golden State Warriors announced that the Dakota Wizards would relocate to Santa Cruz beginning with the 2012–13 season. The team was subsequently renamed the Santa Cruz Warriors. In May 2012, with the Wizards' imminent move to Santa Cruz, long-time Bismarck Tribune reporter, Lou Babiarz, chose an all-time 15-man Dakota Wizards team. 1 2 3 "Dakota Wizards". NBA.com. August 8, 2007. Retrieved April 23, 2016. ↑ "Bliss gets second chance with CBA's Wizards". ESPN.com. August 26, 2005. Retrieved April 23, 2016. ↑ Thomas, Steve (March 20, 2006). "Wizards coach resigns". BismarckTribune.com. Retrieved April 23, 2016. ↑ "Four Teams Leaving CBA for NBA D-League". InsideHoops.com. April 6, 2006. Retrieved April 23, 2016. ↑ "Dakota Wizards pulling out of CBA, eyeing D-League". USAToday.com. March 29, 2006. Retrieved April 23, 2016. ↑ "Dakota Wizards Hire Dave Joerger As Head Coach". NBA.com. May 25, 2006. Retrieved April 23, 2016. ↑ "Rice Sparks Wizards To Overtime Win For D-League Championship". NBA.com. April 29, 2007. Retrieved April 23, 2016. ↑ "NBA Announces D-League Affiliates for 2007-08 Season". OurSportsCentral.com. July 10, 2007. Retrieved April 23, 2016. ↑ "Warriors Purchase Dakota Wizards of NBA Development League". NBA.com. June 28, 2011. Retrieved April 23, 2016. ↑ "Golden State Warriors Purchase Dakota Wizards". NBA.com. June 28, 2011. Retrieved April 23, 2016. ↑ "NBA Development League Approves Relocation Of Dakota Wizards To Santa Cruz". NBA.com. October 10, 2012. Retrieved April 23, 2016. ↑ "NBA D-League Approves Relocation of Dakota Wizards to Santa Cruz, Calif.". NBA.com. October 10, 2012. Retrieved April 23, 2016. ↑ Babiarz, Lou (April 14, 2012). "Wizards to retire Rice's number". BismarckTribune.com. Retrieved April 23, 2016. ↑ Babiarz, Lou (May 28, 2012). "Babiarz: Best of the Dakota Wizards". BismarckTribune.com. Retrieved April 23, 2016.